Mul-T-Lock has launched a new ultra high security solution to present van drivers with the latest innovation in security locking technology to combat the constantly increasing thefts from their vehicles. 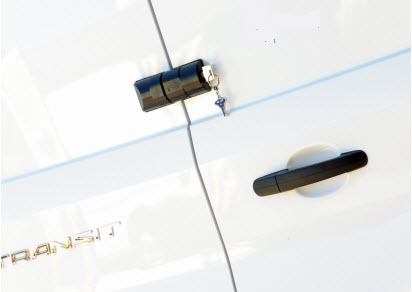 ArmaD lock is a lock design available to bolt onto the surface of any van side or rear door and act as a significant visual deterrent to the opportunist thief. Designed to be professionally installed, and supplied with secure fixings, it is an all in one non-corrosive lock body solution that offers no hanging parts that could damage the paintwork around the lock. The unique angled lock body of ArmaD lock has been carefully created deflect blows from a hammer and together with the steel locking bolt adds extra protection for the doors. Also designed so that users do not have to compromise security by removing portable security solutions such as padlocks, whilst packing or removing stock from the van. With the key removed, users simply need to press the cylinder button to relock the devise once the doors are closed. The launch of Mul-T-Lock ArmaD lock, a solution that can be fitted to almost all van types in the UK , provides locksmiths with a chance to present an all inclusive true innovation in modern vehicle security lock design. As well as being a visual deterrent, the clever inter-locking design of the two body parts become one and add an additional layer of protection from manipulation via forced separation. The extra security for the van doors provided by ArmaD lock offers peace of mind to the owner and ultimate protection for the vehicle and its assets. Installed in over 60 countries worldwide are the measure of Urmet’s global dedication to manufacturing quality products.